The Council of State has extended the grace period for Tekel tobacco-industry workers to reach a deal with the governnment. On Jan. 31, Tekel workers received servance pay and notification that they had once month to find work at other public institutions as 4-C employees (a status given to temporary workers), meaning they would receive a reduction in benefits. The jobs to which they would be transferred would also pay them significantly less. In light of the decision, Tekel workers called a 15-20 day hiatus from protests that have been ongoing for more than two months (see Feb. 9 post). The Council of State decision ruled the government deadline illegal and extended the workers' severance payments. The Tekel workers are demanding that they maintain their current benefits and pay despite the transfer. For the story from Bianet, click here. 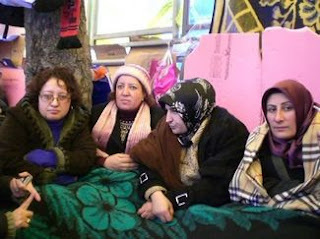 For an empathetic account of the ordeal, see Professor Emel Basturk Akca's piece at TheWip.net.